Income Tax Refund: Know Eligibility, Steps, Claiming, Tracking etc. We often come across the term ‘tax refund’. Let’s understand what it means. A tax refund or tax rebate is a refund furnished to the taxpayer when the tax liability is less than the taxes paid. Taxpayers can avail a tax refund on their income tax if the tax they owe is less than the sum of the total amount of the withholding taxes and estimated taxes that they paid, plus the refundable tax credits that they claim. Tax refunds are usually paid after the end of the tax year. Refunds arise in those cases where the amount of tax paid by a person is greater than the amount which he/she is properly chargeable, as per the Income Tax and other Direct Tax laws. The same is noted under Sections 237 to 245 of the Income Tax Act, 1961. If your tax deducted at source (TDS) from interest on securities or debentures, dividends, salary etc. is more than the tax payable based on regular assessment. In case the same income is taxed in a foreign country (with which the government of India has an agreement to avoid double-taxation) and in India as well. If the tax charged on the basis of regular assessments is reduced due to an error in the assessment process which was resolved. If you find that that the tax payable is in the negative, after considering the taxes you’ve paid and the deductions you are allowed. In case you have investments that offer tax benefits and deductions, which you are yet to declare. You are eligible to avail income tax refund once you file the return of your income. Usually, the date for filing income tax returns is July 31 of every year unless it is extended. First, you must calculate the tax liability that is associated with you, to find the amount of income tax that you will get back as income tax refund. If the amount that you have paid in the form of taxes is more than the tax liability, then the extra amount will be refunded to your account. Generating a tax refund is a simple and seamless process. The payment is either done by cheque or is directly credited to the bank account that is registered with the Income Tax Department. The quickest and easiest method of filing your income tax refund is to declare your investments in Form 16. Your investments may include life insurance premiums paid, house rent being paid, investments in equity/NSC/mutual funds, bank FDs, tuition fees, etc. While filing your IT return, ssubmit all necessary and relevant proofs. In case you have failed to do so and have been paying extra taxes that you think you could have avoided, you will need to fill out Form 30. Let’s understand what Form 30 is. Form 30 is basically a request that your case be looked into and analyzed, so that the excess tax you have paid is refunded. Your income tax refund claim should be submitted before the end of the financial year. Also, your claim needs to be accompanied by a return in the form, as prescribed under Section 139 of the Income Tax Act, 1961. The IT department lets you track the status of your refund. You will receive a message notifying you, in case your refund procedure is yet to be completed by your Officer-in-Charge. The Government of India offers taxpayers the convenience of tracking the cheque by contacting the speed post service that has been tasked with delivering it. You simply have to use the reference number that the IT department will give you. Excess tax paid can be refunded through online methods such as crediting it to your registered bank account through ECS transfer. RTGS / NECS are also commonly used to transfer the tax refund directly into a tax payer’s account using his/her 10 digit account number and MICR code only through the State Bank of India. A taxpayer can track his/her income tax refund via NSDL-TIN website by clicking on ‘Status of Tax Refunds’ or through the income tax departmental website. He/she will need to enter PAN number and assessment year for getting the refund details. Visit the government’s official e-Filing website and select the ‘ITR Status’ button or click here to be redirected to the relevant page. Enter relevant details your PAN number, Acknowledgement number and captcha code, and then click on the ‘submit’ option. Visually impaired individuals can opt for the OTP (One Time Password) option that will be sent on their registered mobile number. The current income tax refund status will be displayed on your screen. Visit the official website of Tax Information Network (TIN) or simply click here to access the relevant page. Enter the essential details like PAN number, Assessment Year and captcha. Select the ‘Submit’ button to view your current income tax refund status. Not Determined – This income tax refund status indicates that your refund has not been processed yet. Therefore, you have to check your prevailing income tax status. Refund Paid - This means that the income tax refund that you are eligible for has been refunded via a cheque or has been transferred to your registered bank account. Refund Failed – This means that the income tax return could not be credited to your registered bank account because of inaccurate details provided by you. Refund Expired: This status may appear only for those who have opted for receiving their income tax refund through cheque. When the refund cheque has not be encashed within 30 days from the date of issuance (the date mentioned on the cheque at the top right corner), it expires. Under such circumstances, you have to get another refund cheque issued against your name. The Cheque has been Encashed – This implies that the income tax refund cheque issued against your name by the Income Tax Department has been received and encashed by you. Refund Returned – This means that the cheque that has been issued against your name by the Income Tax Department has been returned. In such cases, your income tax refund will be cancelled and you will have to request the IT Department to re-initiate your income tax refund by issuing a new cheque. Refund Adjusted against Last Year’s Outstanding Demand – When you have an outstanding income tax refund from the previous assessment year, the amount will get adjusted against the expected income tax refund from the current assessment year. Before adjusting the refund from the prevailing assessment year against the pending demand from the previous assessment year, the Income Tax Department notifies the taxpayer about the same. What to Do If Refund is Not Processed? Income Tax Return form has to be verified by the relevant authority to process income tax returns. If you are yet to receive your refund even after 3 or 4 months after the deadline of 31st July of a particular assessment year, it perhaps implies that your refund has not been verified yet. You can get in touch with the Centralized Processing Centre (CPC) of the Income Tax Department on 1800 4250 0025 or 080-2650 0025 to clarify the reason(s) behind the delay. A number of cases have been reported where the taxpayers have stated that they haven’t received their refund in due time. If this has happened to you too, don’t fret. You will receive an interest of 0.5% on your expected refund amount, for every month or the part of a month for which the refund is delayed. This interest rate is calculated from the 1st of April of the assessment year. However, in case it is found that the reason for the delay can be attributed to you, you will not be liable to receive any interest for that duration. There may also be a case where you have a certain amount of taxes is outstanding against your name. In this case, under Section 245, tax authorities have the power to set-off your refund amount against such outstanding taxes. Note that this can only happen after an intimation is sent to you in writing, proposing that this course of action will be followed by the authorities. To summarize, income tax refund is nothing but getting back the difference between the actual amount of money you’ve paid on taxes and the amount of money you’re expected to pay to the government in a certain financial year. In case you wish to save your hard earned money, you can declare your investments such as rent and other permissible deductions like mutual funds, NSC certificates, post office time deposit (POTD) certificates, stocks and equity investments, tuition fees of your children, home loan EMI , bank FDs or term deposits, etc. at the start of the assessment year. Hence, in order to make full use of tax benefits and save your hard earned income, it is imperative for a taxpayer to read up on the various tax-benefits and schemes made available to them. When am I eligible for income tax refund? When the amount of income tax paid is more than the income tax you are liable to pay, then as a taxpayer, you are eligible for an income tax refund. How do I file my income tax refund? The easiest and fastest way to file your tax refund is to declare your investments in Form 16. In order to file your tax refund, you can visit www.incometaxindiaefiling.gov.in and file your income tax refund. How do I track my income tax refund? There are 2 ways to track your income tax refund. One way is to use the reference number that the IT department will give you, if you’ve claimed it through cheque. If you have claimed it via direct transfer, then you can track the income tax refund via NSDL-TIN website by clicking on the ‘Status of Tax Refunds’ option or through the Income Tax Departmental website. What are the ways in which tax refund is generated? Generating income tax refund is an extremely simple procedure. The payment is either done by cheque or is directly credited to your registered bank account. How can I check my income tax refund status? You can visit the official website of the income tax department to track the refund status. How can I claim my income tax refund after due date? If you want to claim your income tax return after the due date of 31st July of every year, you can do so by filing for a belated return. A belated return can be filed either before the completion of the assessment year or by the end of the relevant assessment year, whichever is earlier. For instance, for the assessment year 2019 - 20, you can file a belated return before 31st August 2019 or, at the most, by 31st March 2020. How can I get income tax refund? The Income Tax Department offers income tax refund via two methods – cheque and account transfer through ECS. You can opt for either of these options, as per your preference. How long does it take to get income tax refund? For salaried persons, income tax refund may be credited to their registered accounts within a short period of two weeks. But this is true only for those income tax returns that have been filed at the earliest. On an average, the estimated time span for income tax refund is between 1 month and 4 months. For business organizations, income tax refund or IT refund is generally credited between 3 months to 6 months. How long does it take to get your tax refund direct deposit? In case of direct deposit to your registered bank account, income tax refund is processed within 2 months to 6 months from the date of e-filing your income tax return online. How many days does it take for income tax refund? In case of direct deposit to your registered bank account, income tax refund is processed within 1 months to 4 months from the date of e-filing your income tax return online. In case of income tax returns that are filed physically, it takes longer for them to receive their income tax refund. When can I get my tax refund for 2018? You will receive the income tax refund for the financial year 2018-19 in the year 2019. It generally takes a taxpayer a period of 1 month to 4 months from the date of filing for income tax returns, to receive the same. My Income Tax refund is still not processed. How do I escalate this? In case you have not received your refund even after 3 or 4 months after the deadline of 31st July of the assessment year, it is recommended that you get in touch with the Centralized Processing Centre (CPC) of the Income Tax Department on 1800 4250 0025 or 080-2650 0025 to inquire the reason(s) behind the same. How to check Income Tax refund status from government’s website? 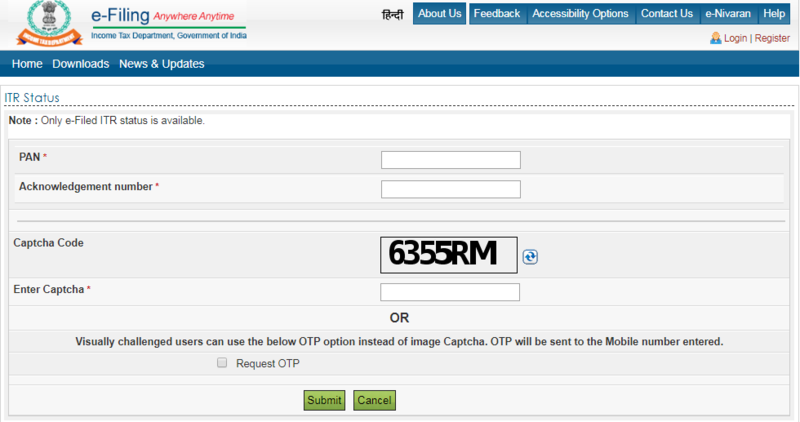 Login to the website with your User ID, Password and Date of Birth / Date of Incorporation, followed by Captcha. Select the ‘My Account’ option and then click on "Refund/Demand Status" to view your income tax refund status, along with other important details like reason for the delay in refund (if any), the assessment year and the mode of payment opted for.